Shamsa, F. (2005). Stability of Trinitroglycerin in Polyethylene Glycol 400. Iranian Journal of Pharmaceutical Sciences, 1(4), 203-207. Fazel Shamsa. "Stability of Trinitroglycerin in Polyethylene Glycol 400". 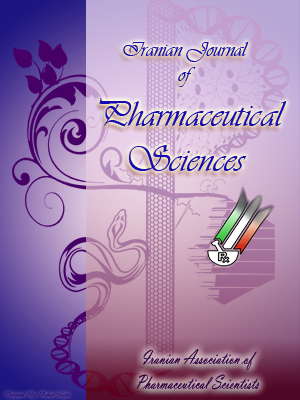 Iranian Journal of Pharmaceutical Sciences, 1, 4, 2005, 203-207. Shamsa, F. (2005). 'Stability of Trinitroglycerin in Polyethylene Glycol 400', Iranian Journal of Pharmaceutical Sciences, 1(4), pp. 203-207. Shamsa, F. Stability of Trinitroglycerin in Polyethylene Glycol 400. Iranian Journal of Pharmaceutical Sciences, 2005; 1(4): 203-207. In this study, the stability of trinitroglycerin (TNG) in polyethylene (PEG) 400 was investigated according to Arrhenius approach. The reaction rate constant (k) for the thermal disintegration of TNG in PEG 400 at various temperatures was counted based on the percents of remaining TNG at different intervals of time at a specific temperature. The results showed that “k” at 40, 50, 60, 70, 80 and 90 ºC were 6.5x10- 4,3.57x1 0- 3, 4.7x1 0- 3, 3x1 0- 2, 6.2x10- 2 and 6.5x1 0- 2, respectively. By plotting “log k” against temperature (1/T), “k” was obtained at 5 and 20 oC which was 1.47x10- 5 and7.94x10-5, respectively. The results showed the time required to attend 90, 80, 70, and 50 percent of the original TNG at 5 oC was 9.76, 20.7, 33, and 64.2 months, respectively. The results assist in the calculation of the expiration time of TNG/ PEG 400. For over a century, trinitroglycerin (TNG) has been used to prevent or relieve angina pectoris . TNG is available in different pharmaceutical formulations including oral tablets, sustained release capsule or tablets, sublingual pills and alcoholic solution for i.v. administration. TNG is usually formulated with miglyol oil as vehicle in the sublingual pills. Miglyol oil is not miscible with water and is fairly expensive. On the other hand, polyethylene glycol 400 (PEG) is water miscible, not expensive, and readily available in the market. Therefore, this study was undertaken to evaluate the stability of TNG in PEG as a first step for possible substitution of miglyol oil by PEG in the sublingual pills or using TNG in PEG solution directly without special formulation. in which “k” is the specific reaction rate, “A” is a constant known as the Arrhenius factor or the frequency factor, “Ea” is the energy of activation, “R” is the gas constant, 1.987 calories/deg mole, and “T” is the absolute temperature. In the past it was a common practice in many drug companies to evaluate the stability of their products by observing them for a year or more. Such a method was time consuming and uneconomical. Accelerated studies at higher temperatures were also used by some companies. For example, some companies used the rule that the storage of liquid at 37 ºC accelerated the decomposition at twice the normal temperature rate, while other manufacturers assumed that it accelerated the breakdown by 20 times of the normal rate . The method of accelerated testing of pharmaceutical products based on the principles of chemical kinetics was demonstrated by Garrett and Carper . According to this technique, the “k” values for the decomposition of a drug in solution at various elevated temperatures are obtained by plotting some factors of concentration against time. The logarithms of the specific rates of decomposition are then plotted against the reciprocals of the absolute temperature, and the resulting line is extrapolated to the room temperature or other required temperatures. The k20 is used to obtain a measure of the stability of a drug under ordinary shelf conditions. Since TNG products are usually kept in refrigerator, therefore, k5 was obtained after extrapolation of the resulting line. Glycerin, nitric acid, sulfuric acid, potassium nitrate, phenol, nitroglycerine and ammonia used in this investigation were from Merck Chemical Company. Figure 1. Plot of log k against 1/T for thermal decomposition of TNG in PEG 400 at different temperatures. Table 1. Stability of TNG in PEG 400 after thermal decomposition at different temperatures for various intervals of time (n = 3). Fifteen grams of colorless phenol was dissolved in 100 ml of concentrated sulfuric acid and heated for 5 h on a water bath. After cooling, it was kept in a closed bottle in the dark. Exactly 80 mg of KNO3 was weighed and transferred to a 100 ml volumetric flask. After dissolving in 1 ml distilled water, the solution was made to volume by glacial acetic acid. Different volumes (0.5, 1, 1.5 and 2 ml) of KNO3 solution were sampled into a 100 ml volumetric flask containing 2 ml phenol disulfonic acid solution. After mixing, it was left for 15 min. at the room temperature.Then, 50 ml distilled water and 10 ml ammonia were added and brought to volume by distilled water. The absorbance of the solution at 410 nm was measured against a blank. TNG (200 mg) was mixed with PEG 400 in a volumetric flask and made to 100 ml with PEG to have a solution of 2 mg TNG/ ml PEG. Two ml of TNG/PEG (2 mg/ml) was transferred into each of 18 test tubes numbered in triplicate by 0, 1, 2, 3, 4 or 5. One set was left at the room temperature and the other set was transferred to an autoclave at 40 ºC. After 1, 2, 3, 4, and 5 h, they were taken out of the autoclave and kept with blanks at the room temperature. The above procedure was repeated exactly at 50, 60, 70, 80 and 90 ºC. After equilibration of the solution temperature with the room temperature, the analysis of the remained TNG in the samples was performed. Each sample (0.4 ml) was transferred to a 25 ml volumetric flask and phenol disulfonic acid (2 ml) was added and left at the room temperature for 15-30 min. After adding distilled water (10 ml), it was made to volume by ammonia solution. The absorbance of the formed yellow color was measured at 410 nm with a Bausch and Lomb spectrophotometer. nm with a Bausch and Lomb spectro-photometer. Table 2. The reaction rate constant (k) for the thermal decomposition of TNG/PEG at different temperatures. The most significant property of the nitrate esters is violent detonation on slight shock. More than enough oxygen is present to convert the carbon and hydrogen into the corresponding oxides, with liberation of elemental nitrogen . None of the decomposition products such as N2, CO2 and H2O interfere with TNG analysis by spec trophotometry. TNG is decomposed at 50-60 ºC, appreciably volatile at 100 ºC, evolves nitrous yellow vapors at 135 ºC, and explodes at 218 ºC . In a previous study, the predicted stability for a PEG 400 solution of TNG in term of its 10% decomposition (90% remaining) at 25 ºC was approximately 7 days , but the stability at 5 ºC was not investigated. Various analytical procedures for the determination of T N G were reported such as spectrophotometry and high performance liquid chromatography [6-8]. To measure the stability of TNG in PEG at the room temperature and at 5 ºC, the reaction rate constant (k) at the required temperatures is necessary. For this purpose, primarily the percentage of TNG/PEG 400 remained at various temperatures (40-90 ºC) for different periods of times was measured (Table 1) by using the phenol disulfonic acid method . Then, the reaction rate constant (k) of TNG/PEG 400 was calculated for different temperatures (40–90 ºC) (Table 2). T h e following equation was applied to calculate k at different temperatures: in which “t” is the time interval between the original concentration (Co) of TNG and the remaining concentration (C) at some time l a t e r. By plotting log k against 1/T, the constant “k” at 20 ºC and 5 ºC was measured (1.47 x 10-5 and 7.94 x 10-5, respectively) by extrapolating the straight line such as shown in Figure 1. Because TNG is usually kept in the cold (refrigerator) during marketing, therefore, its expiration date should be calculated on the basis of decomposition at 5 ºC. In this respect and by substituting “k” in equation 1, the time necessary for the remaining percentage of TNG at a specified temperature was obtained (Table 3). From this study, the expiration time for TNG/PEG 400 is estimated to be about 33 months. Table 3. Comparison of the stability of TNG in PEG 400 at 5 ºC and 20 ºC. This investigation was supported by a grant from the Research Council of Tehran University of Medical Sciences. Robertson RM, Robertson D. Drugs used for the treatment of myocardial ischemia. In: Goodman Gilman A, (editor). Goodman and Gilman’s “the pharmacological basis of therapeutics, 7th ed., New York: Macmillan Publishing Company, 1996; pp. 759-82. Martin AN. Kinetics. In: Mundorff GH (executive editor). Physical pharmacy. London: Lea and Febiger, 4th ed., 1993; pp. 284-321. Garrett ER, Carper RF. Prediction of stability in pharmaceutical preparations. (I) color stability in a liquid multisulfa preparation. J Am Pharm Assoc Sci Ed 1955; 44: 515-8. Fieser LF, Fieser M. I n t roduction to organichemistry. Tokyo: Maruzen Asian Edition, 1975; pp. 85-114. Budavari S. The merck index, an encyclopedia of chemicals, drugs and biologicals. 12th ed ., (editor). NJ: Merck research laboratories, division of Merck & Co. Inc., 1996; pp. 1135-6. Suphajettra P, Strohl JH, Lim JK. Nitroglycerin stability in polyethylene glycol 400 and povidone solutions. J Pharm Sci 1978; 67: 1394-6. Severin G. Rapid high-performance liquid chromatographic procedure for nitroglycerin and its degradation products. J Chromatog1985; 320: 445-9. British Pharmacopeia. London: The Pharmaceutical Press, 1993; p. 314.